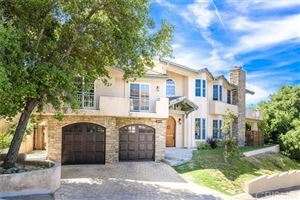 Nestled in the western San Fernando Valley, just north of central Calabasas, Hidden Hills is one of the most affluent areas in the United States. The community is just 1.7 square miles. It is home to just over 600 families, who take solace in the seclusion of the town, hidden behind a tightly guarded gate. The homes range from approximately 2,200 square feet to over 24,000 square feet. There are no sidewalks or street lights and each property sits on an at least an acre lot. Equestrian activities are deeply rooted in Hidden Hills history and are still central to life there. Hidden Hills is home to Round Meadow Elementary School, which is part of the Las Virgenes Unified School District. A private school option for high school is Mesivta of Greater Los Angeles. The other schools serving Hidden Hills are located just outside of the community. Those who live in Hidden Hills have access to riding arenas, tennis courts, a competition-sized pool, recreation center, and a state of the art Performing Arts Theater. The city has a summer camp for children, community and children's theatre programs, annual parades, carnivals, parties, welcome wagon, snow days, and weekly community-wide barbecues all summer long. In nearby Calabasas, you’ll find many public parks, including Juan Bautista de Anza Park, which features two playgrounds, picnic areas, a hockey rink and a multi-purpose room. The Park is also home to the Calabasas Pumpkin Festival each October. True to its "rural feel" roots, you won't find any shopping areas in Hidden Hills. Just a couple miles outside the Hidden Hills gates, you'll find The Commons at Calabasas. The upscale retail center features an open air layout, with luxury stores including Kate Spade, Polachek's Jewelers, Williams Sonoma Home and Paper Source. You'll also find a Ralph's grocery store, nail salon, blow-dry salon, Edwards movie theater and several restaurants. Across the way from the Commons, in the Parkway Calabasas Shopping Center, you'll find a new Trader Joe's Market, Susie's Cakes, as well as boutiques. If you're looking to eat out, you'll find plenty of dining options in Calabasas. Calabasas Road features several restaurants including Pedalers Fork, The Six Chow House, and Lovi's Delicatessen. You'll also find a dozen eateries, from pizza to seafood at The Commons. On the northern part of the city, you'll find Saddle Peak Lodge and Sushi Nishi.